If you have fine hair, then silver is the color of the season for not only older women, but for all ages. Women can proudly claim to be the founders of the ever popular silver pixie trend world-wide. Doesn’t she look cool and attractive in this elegant haircut? Thick hair looks great, but they have their own issues. They are difficult to maintain and style and everyday it becomes a task. Older women with thick hair should go for the choppy haircut that blends well with the nature of the hair. The cuts may be slightly fashionable than the others, but they are easy to manage and care. Yes, short haircut for women over 50 also includes asymmetrical cut that has the tendency to make you stand out from the crowd. This different looking haircut is elegant and suits older women perfectly especially the ones with higher cheekbones. Combine the pixie with a rich metallic tone to look like a sassy silver fox. A pixie is a classic haircut that looks good anytime. You can style it according to the shape of your face and personality. To enhance the facial features and the amazing cheekbones, you can include the long side-swept bangs here. Short hairstyles for women over 50 are generally full of layers. As the length of the layers varies, it helps build the volume and boosts the texture. This layered bob haircut is very attractive because of the honey blonde color. Add grain with the texturizing sprays and to add shine to the hair add shine sprays. Short and edgy pixie with their end highlighted makes the styling effortless and makes it look gorgeous. You can wear this style on day to day basis. It is a good coloristic pattern for gray hair in brunettes. This hairstyle makes you look youthful and full of energy. A bob cut is an all-time favorite that has been popular for decades. It is classy and elegant. Bob cut is not exactly a short haircut, but a nice in-between two haircuts, primarily the extremely short one and the longer haircuts. Pair this with thin bangs and consider highlights for a modern looking hairstyle. This is a nice layered chin length haircut that is nicely combed backwards to open the facial contours. 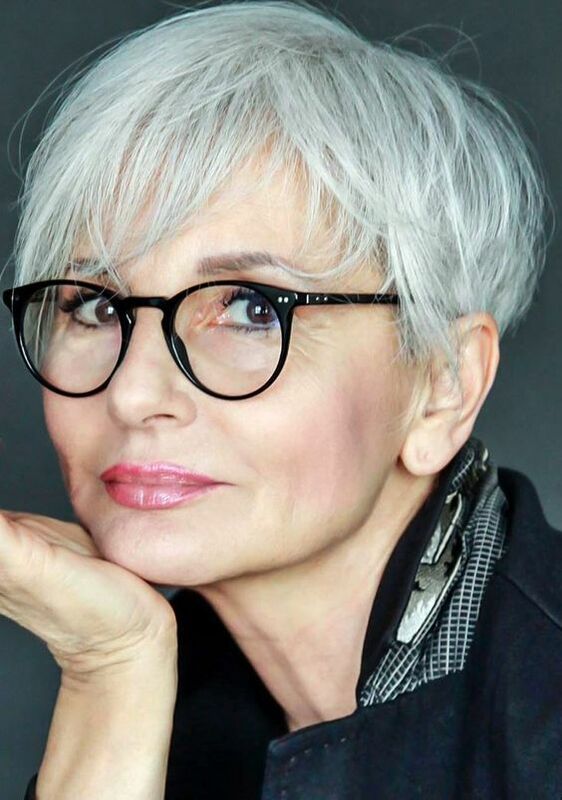 Combing the hair backwards close to the roots and the nonchalant bangs that are seen caressing the forehead makes this haircut look just perfect for older women. Don’t want to make your grays look prominent, then it’s time for you to go bold with a two-tone pixie cut. Keep the top blonde and the bottom brunette. Mix some darker lowlights through the crown to add some dimension and to combine both the looks together. If you have natural curls, then show off the curls with a nice undercut. Use a warm color and use highlights to break up the color and accentuate the texture. It is very simple to wear this haircut; it is as simple as washing and ready to go. To enhance the curls use a nice curling product. To add volume to your cut, cut your hair in short layers around the crown of the head. This is particularly useful for women with round faces as the height will increase the overall shape. Add some contrasting colors on the side to visually balance the volume on top. Next articleHow to Recycle Plastic Bottles?